About the Book: Thirteen-year-old Nate is from a small town in Pennsylvania and he dreams of being on Broadway. When his best friend Libby tells him of an open audition of ET: The Musical, Nate and Libby devise a plan for Nate to run away to New York City and audition. Will this be Nate's chance to move out of his small town and become a star? GreenBeanTeenQueen Says: I knew I was going to love this book from the moment I heard it booktalked at ALA. I love musicals, I love show tunes, I love Broadway. I spent every summer from fourth grade into college attending and working at a fine arts summer camp. I was a drama and choir kid all throughout my school years. I knew Nate and I would become kindred spirits. And I was not disappointed one bit. Nate is a kid that I would love to have in my library and we would talk Broadway and it would be awesome. I love Nate that much. He has the perfect blend of humor and heart that you just have to adore in a main character. He's from a small town, so he's a bit naive at times, but I believed it all-this is the first time Nate's ever been out of Jankburg PA (except for that trip to Disney) and this is first trip to a big city. His innocence about New York is part of his charm-he sees the good in everything which makes you want to cheer Nate on. In New York, Nate discovers what Broadway is like-from auditioning in a room full of adults to pushy stage moms and incredibly talented kids up for the same role as you. Tim Federle is obviously writing about a subject he knows-and knows well. He captures the craziness of a show, the excitement and nervousness of auditions and the painstaking wait as you wonder if you'll hear more. This isn't just Nate's journey to New York, but also to accepting who he is. Nate is teased back home for liking musicals. He's a bit of an outsider and doesn't feel like he fits in. He's teased for being gay, but as Nate says, he's thirteen and he doesn't know who he likes and why should it matter anyway? Nate's journey to New York opens him up not only to the world of Broadway, but to a larger world outside the small minded town he's used to. 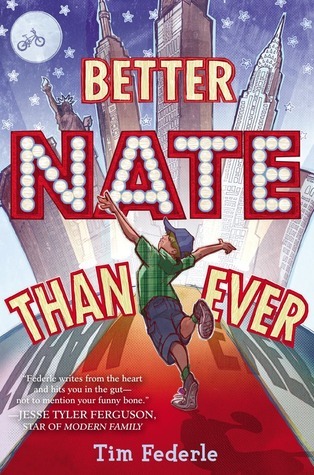 What I appreciated about Nate's story was that it was a story about Nate learning that he's awesome and it's OK to love musicals-gay or straight-and that he can be a boy who loves to sing and use Broadway flops and curse words. I was lucky enough to listen to this one on audiobook and there are some authors that are just meant to narrate their books and Tim Federle is one of them. He gives Nate a wonderful voice and blends his optimism, innocence and passion for musicals in a brilliant way. He also plays the jokes well and really adds to Nate's humor. I'm sure I would have laughed if I had read this book, but listening to it I was laughing out loud the entire time. It's well worth listening to! A funny and heartwarming read that has worked it's way into my heart. It's the perfect book to hand over to kids who feel as though they a bit of an outsider and are looking for a place to belong. I hope this debut isn't the last from Federle-he's a writer to look forward to. I recently read this one with my eyes and thought it would make for a wonderful audiobook. I will have to look it up. I adored this book!